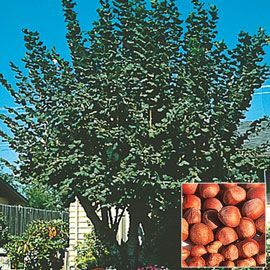 American Hazelnut Tree | Henry Field's Seed & Nursery Co.
Small size, big production! At just 15 ft. tall, can be used as an attractive shrub-like landscape plant with fiery fall foliage. Nuts are easy to crack and contain small sweet kernels that are delicious for eating fresh and cooking. Harvest from September to October; plant two for pollination purposes. Height 10 - 15 feet. 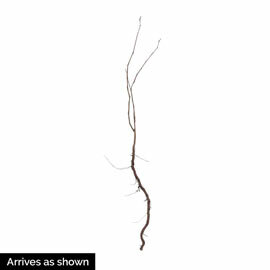 For each offer ordered, get 1 tree. Height: 10 - 15 feet. Spacing: 10 - 15 feet. Foliage: Rough, dark leaves; turn bronze or crimson in Fall. Soil Requirements: Well-drained, very moist, fertile loam soil; pH adaptable. Growth Rate: Medium to fast growth. Fruit: Clusters of 2 - 6 round, 1/2 inch long nuts with smooth, thick shells. Pollinator: Plant 2 or more for best pollination. Yield: Approximately 20 - 30 pounds of nuts at maturity.